Hello, and happy Monday We R fans! 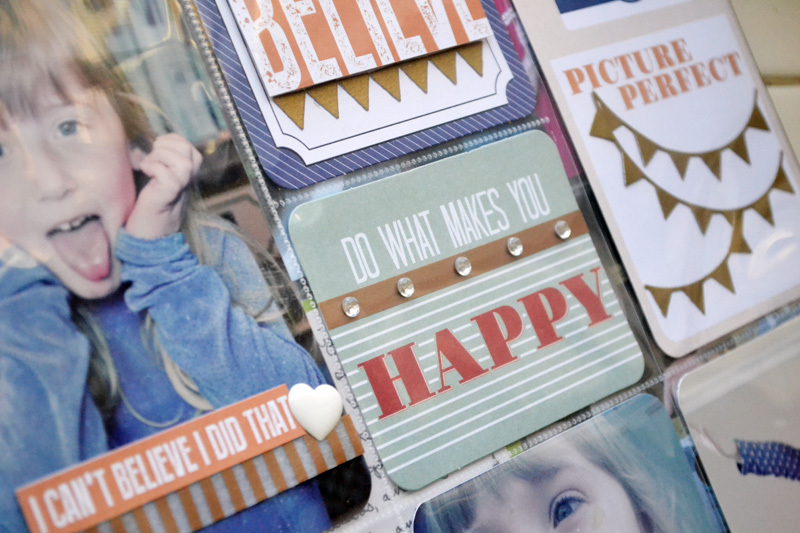 Let’s start the week off with an Albums Made Easy layout featuring the beautiful new Teresa Collins Quoted Journaling Cards. Most of my Albums Made Easy layouts are monthly reviews, but every now and then I like to do something different–like this “day in the life” page. While my older kids are at school during the day, it’s just my four year old daughter and me at home. She’s a lot of fun to hang out with–a total bundle of energy, enthusiasm, and silliness. I love that these photos capture her personality and that they’re a pretty good sample of a typical day with her (and yes, she does change clothes about six times a day and loves to take selfies). I love that Teresa’s sets include some acetate cards that you can use as photo overlays. I used a 3×4 card over my 6×4 photo, placing it to the side of my daughter’s smiling face. 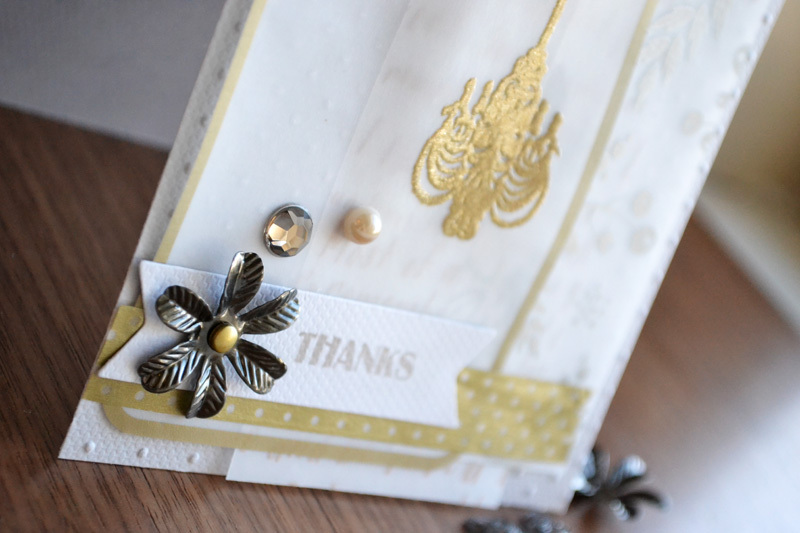 I pulled in some papers from the Sheer Metallic collection for die cutting and punching accents. I chose some Enamel Shapes and other similar accents without too much bulk or dimension. I also like to pop some elements up on foam squares for a bit of depth. 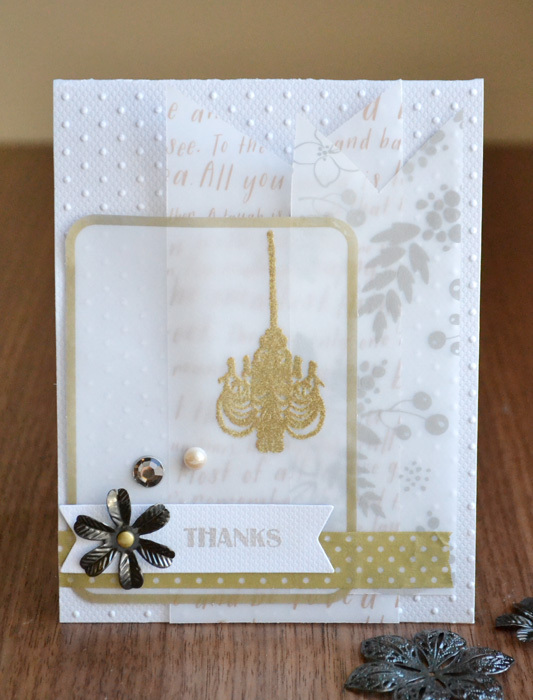 I added some metallic Washi Tape which coordinates well with Teresa’s cards since she included some gold glitter accents. I also included some hand drawn, and hand written details to balance the clean and graphic feel of the cards. I used a fun technique to create the DIY journaling card below. First I trimmed a 6×4 piece of white textured cardstock and rounded the corners with my 1/8 and 3/8 inch Corner Chomper. 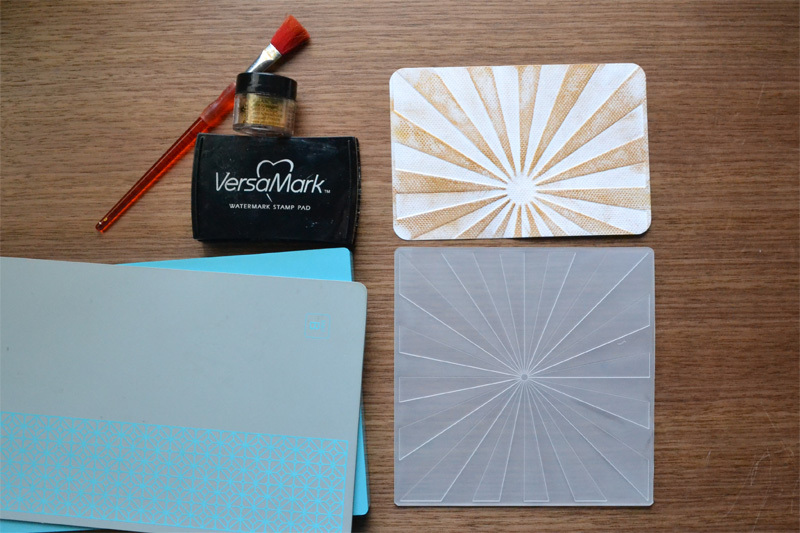 Then I embossed it with the new Stripe 6×6 embossing folder and my Evolution. Next I gently rubbed my watermark ink pad over the embossed design, and used a soft bristle paint brush to apply some gold metallic pigment powder. The powder clings to the watermark ink, and the excess wipes away using a paper towel. 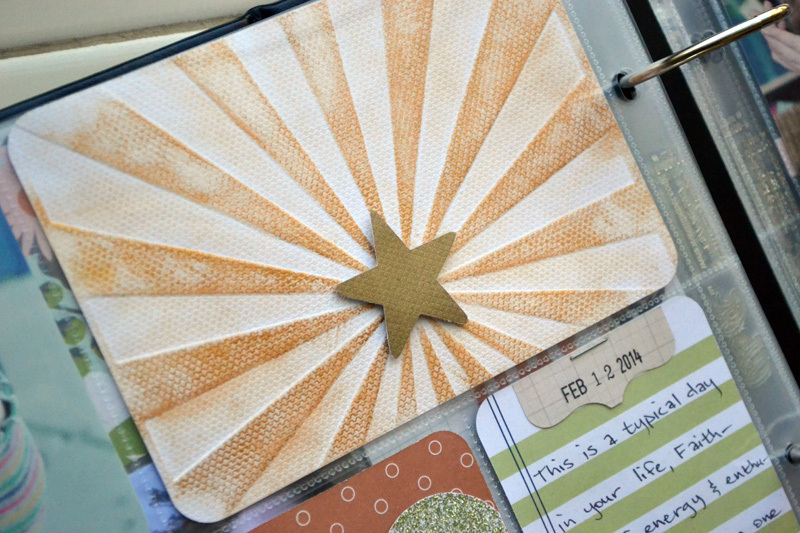 If you haven’t had a chance to check out the new Teresa Collins Albums Made Easy Journaling Cards, take a look. They’re beautiful and include lots of fun die cut, acetate, and other specialty cards. 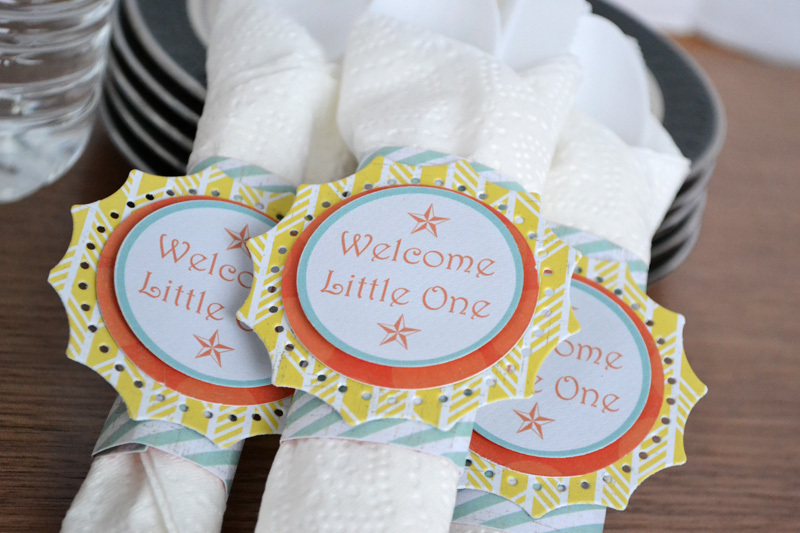 Are you in need of a unique way to give a gift card at a baby shower? Do you have a friend who isn’t into traditional baby colors? I may just have the solution for you! 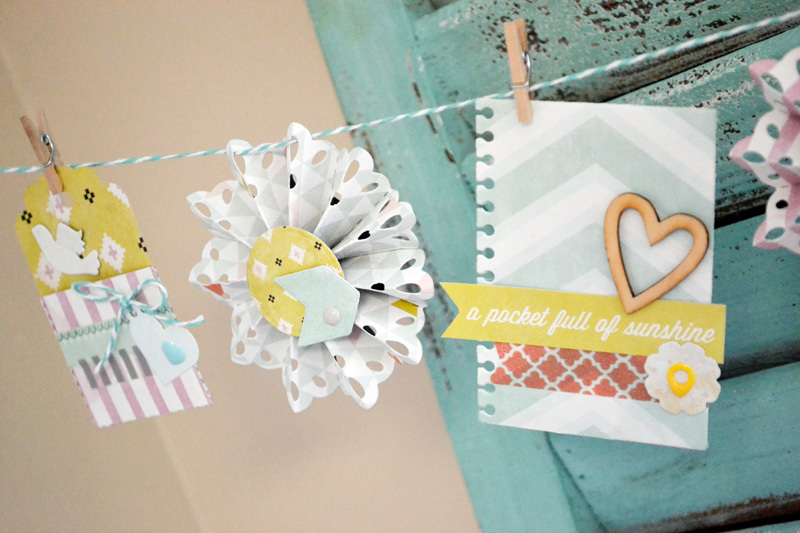 Using some Lifestyle Crafts and some We R Memory Keepers you can create this adorable little gift bag. It’s just right for a gift card for your Mom-To-Be. 1. Start out by using your Lifestyle Crafts Paper Bag Template. Run it through your machine, fold and adhere it. Set the bag aside. 2. 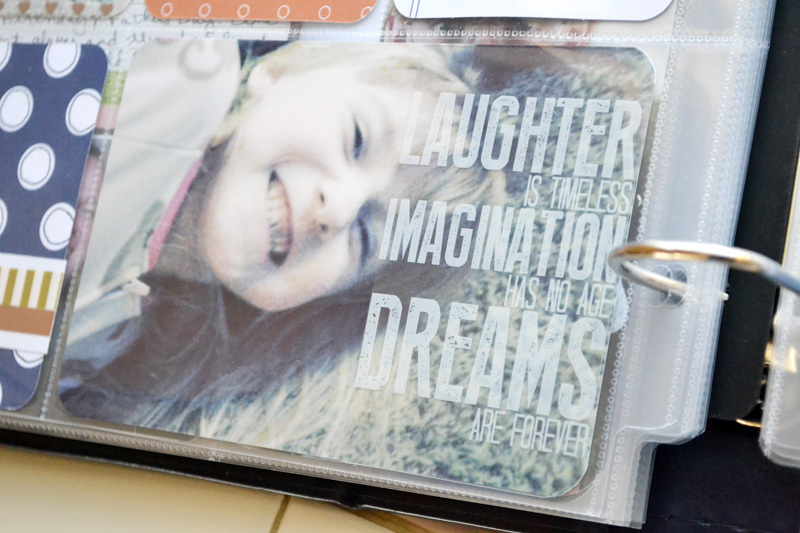 Next using your We R 3×4″ punch, you are going to pick a patterned paper and punch out a 3×4″ card. 3. Trim a 1/2” off of the card and adhere it to the front of the bag as shown. You can distress the edges beforehand if desired. You can do this by scraping along the edges with scissors, or your finger nail. 4. Cut a 2 1/2 x 4″ strip of Sketchbook paper. Distress if desired. Tear along the top and adhere it to the bag, as shown. You’re ready to add the next layer. I cut a 2 1/2 x 2″ strip of Acrylic paper. Again, distress if desired. I tore the bottom of the paper this time and adhered it on top of the previous layer. 5. Add an embossed tag on the front. Punch out the heart and distress the edges. Add foam mounting squares to the back and then pop the heart onto the bag. You can place it right in the center, or slightly off center like I did. I cut a strip from the Collage patterned paper, I used the stripes. I used a heart punch to punch hearts out along the strip. 6. 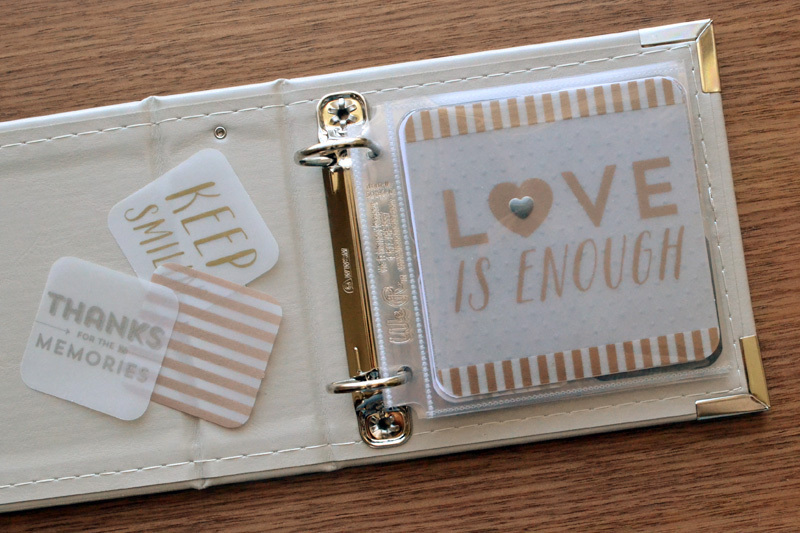 Print out a sentiment and add it to the bag with Baker’s Twine. Hi, hello, and howdy! My name is Amanda Rose Zampelli and I am a new designer over at We R Memory Keepers. 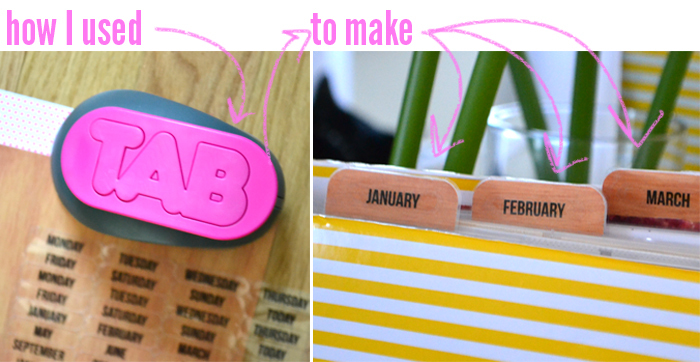 I’m coming to you today to show you how I used one of the We R TAB Punches to create adorable tabs in my Albums Made Easy album. For more photos and details, head over to my blog. ♥ So excited to meet you, and I look forward to getting to know you all better! 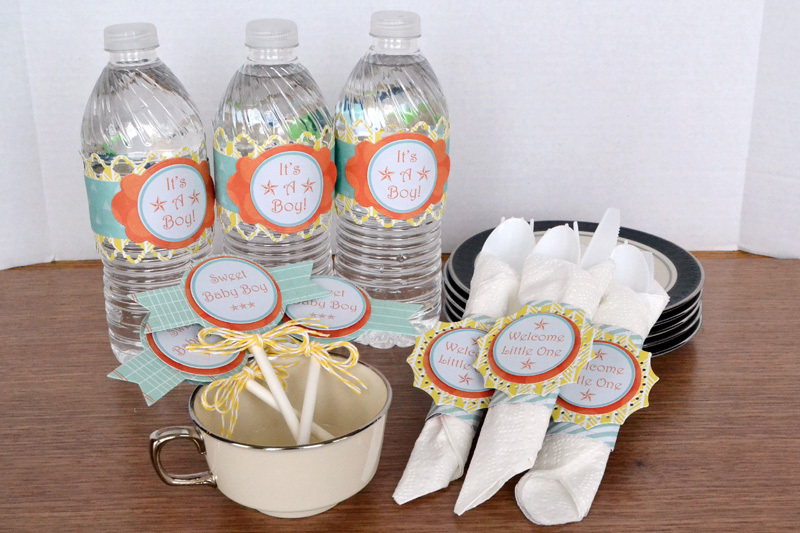 One of the many fun things about getting ready for baby to come is the baby shower. 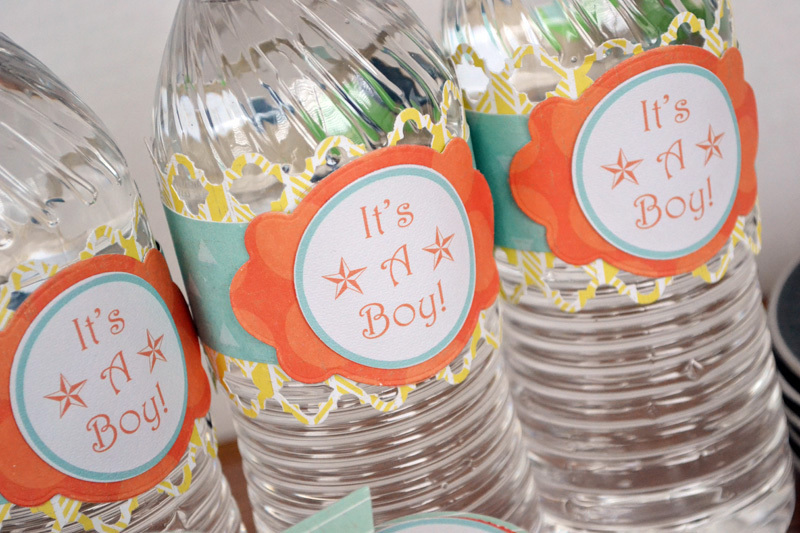 Here’s some baby boy shower decor inspiration, plus free printable labels if you’d like to make this set for yourself. I used some blue, orange and yellow tone-on-tone papers from the Notable collection and die cut some tags from them using the Label It Kit. Then I added some labels that you can download HERE for free and print if you’d like to create your own shower decor. The printable labels are made to fit a 1 3/4″ circle punch or cutting system. I used my Trellis 2 Edge Punch to create the background for the bottle wraps. Designer tip: hot glue is a great adhesive when altering round objects. It ensures your paper maintains the round shape. 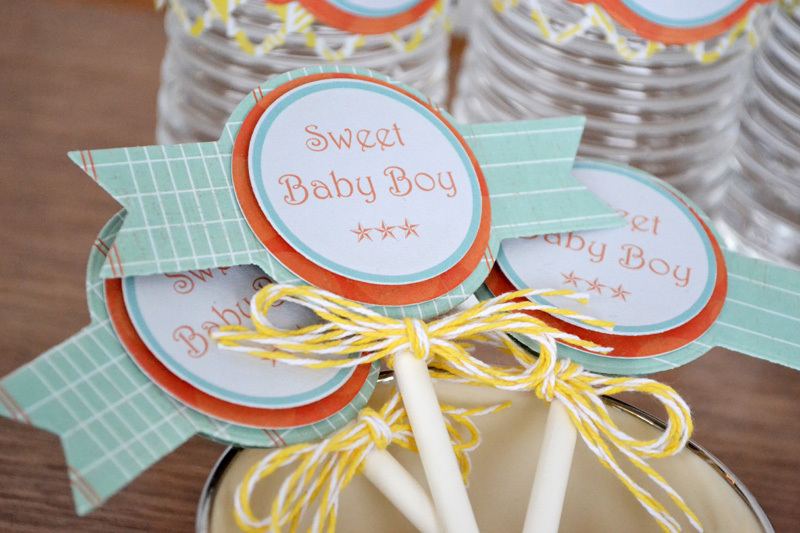 These cupcake toppers are hot glued to lollipop sticks and tied with triple strands of Baker’s Twine. I die cut an extra circle to cover the back so the area where the lollipop stick is adhered to the label doesn’t show. Finally, I made these napkin rings–I love that the tags look like little suns! Notice that the papers I used for this baby project are not from a baby-specific collection, but they still work great. 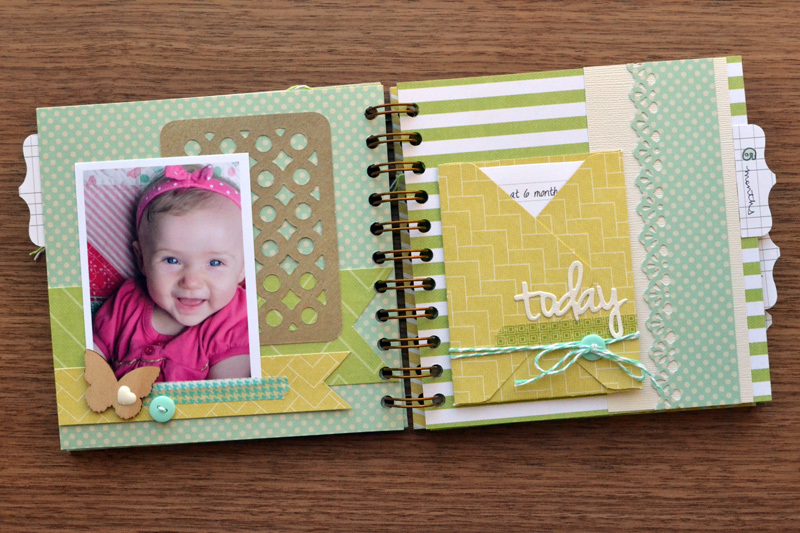 You can pick your favorite baby color scheme and use any non-themed papers you’d like. Just be sure to add tags, labels, or some other element that is baby related. If you’re looking for DIY baby announcement ideas, here’s a simple but clever way to share the happy news with your family and friends. I combined a few Lifestyle Crafts Letterpress plates with some masculine colored patterned paper from the Game Day and Notable collections to create this interactive card. I started with a 5 1/4 x 5 1/4 piece of Thick Square Flat Letterpress Paper and printed the chevron pattern from the Spooked Printing Plates set, and the hand-stitching image from the Petit Printing Plates set. Since they both were printed in Orange Letterpress Ink, it was easy to print them at the same time. 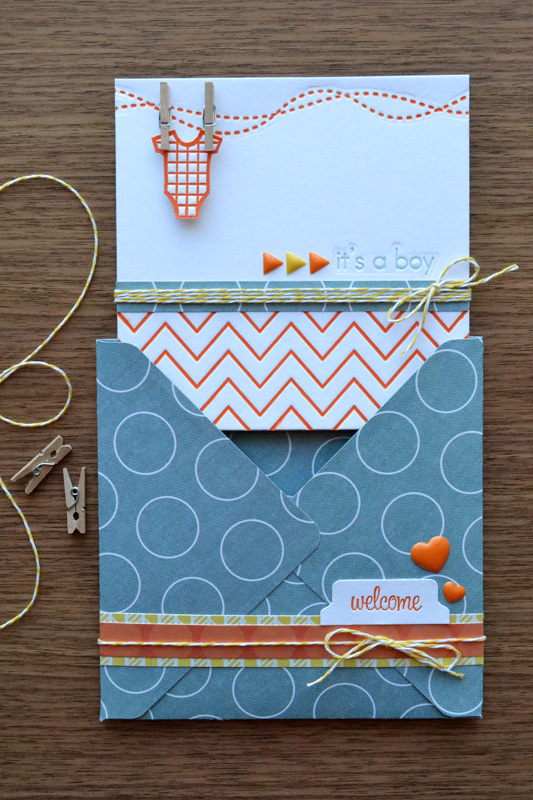 Then I printed the baby onesie using orange ink on a White Mini Flat Card and cut it out. 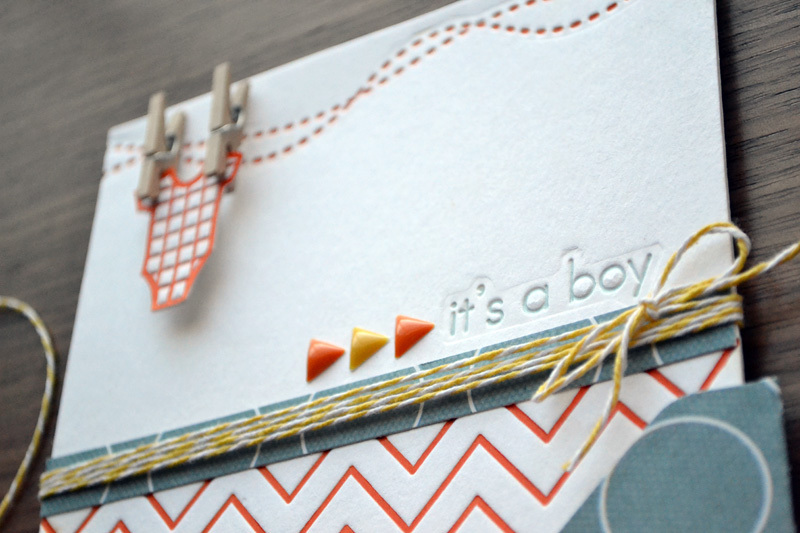 Next, I took the 51/4 x 5 1/4″ piece of paper with the orange printing on it, and printed the “It’s A Boy” sentiment on it with my Letterpress using Light Blue Letterpress Ink. To finish off the card, I added the baby onesie image with a foam square and mini wooden clothespins to the top of the card. Then I created a border of blue patterned paper from the Game Day Collection, and added some Baker’s Twine and Enamel Shapes. 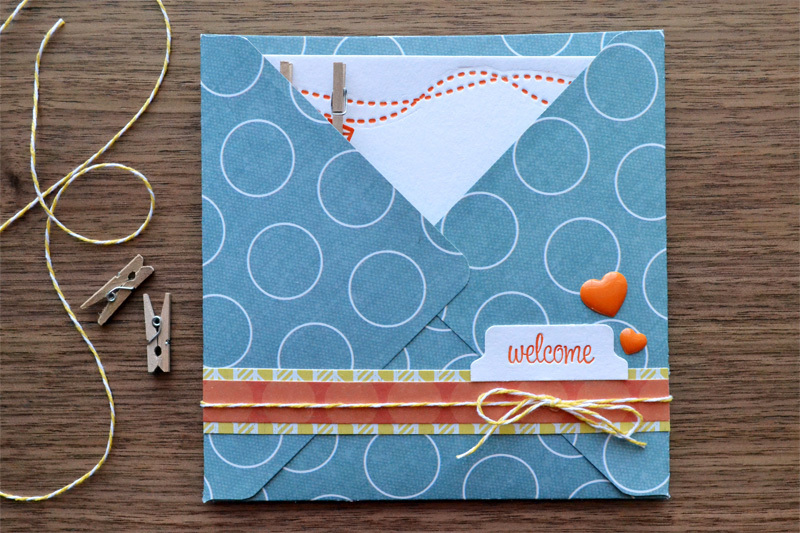 To create the pocket for this card, I made a 5 1/2 x 5 1/2 ” envelope with my Envelope Punch Board and trimmed off the top flap. Designer tip: to cover the sports themed pattern (or “B” side) showing on the inside of the envelope I used the top flap I cut off, rotated it upside down (with the matching blue side showing), and adhered it to the top inside of the envelope. It fit perfectly to cover up the little bit of the sports pattern that was showing. I added a border and a Letterpress sentiment to the outside of the pocket that I punched out with my Tab Punch, along with some twine and enamel shapes. You can add a photo and details, or just leave the card as is for a gender announcement. The recipient will not only enjoy learning the wonderful news, but will also enjoy the fun interactive element of this card. 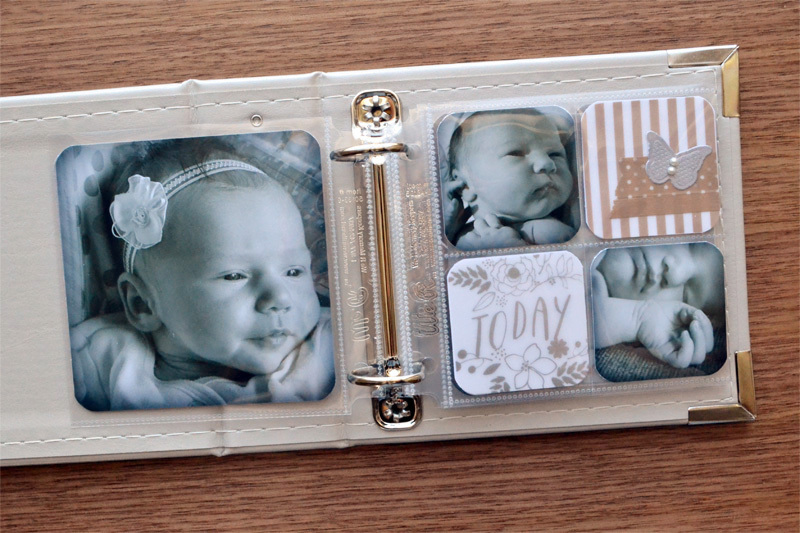 Yesterday I shared an Instagram Baby Album, and today I thought I would share another mini album option to document your baby photos. Just like the instagram album, this album is great to keep and display for yourself, or you can make one as a gift for a friend or family member. I started with two 6×6 pieces of chipboard and covered them with some patterned paper in soft colors from the Game Day and Hip Hip Hooray collections. Then I decorated the front cover with some paper, die cuts, alphas, and embellishments. During my daughter’s first year I took a photo of her each month in front of the same background to document her rapid growth and change. 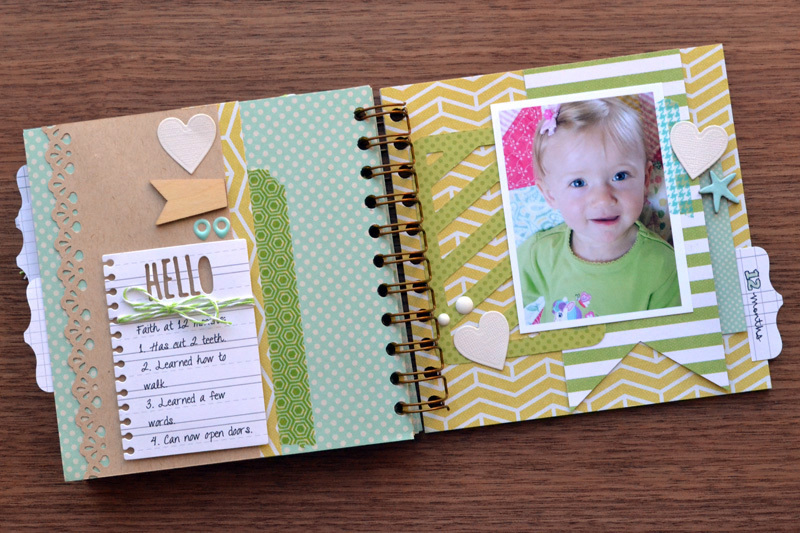 For each page of my album I included one of her monthly photos, plus some list-style journaling about what she had learned or how she had grown that month. Most of the journaling is printed on a tag or journaling card tucked away in a pocket. 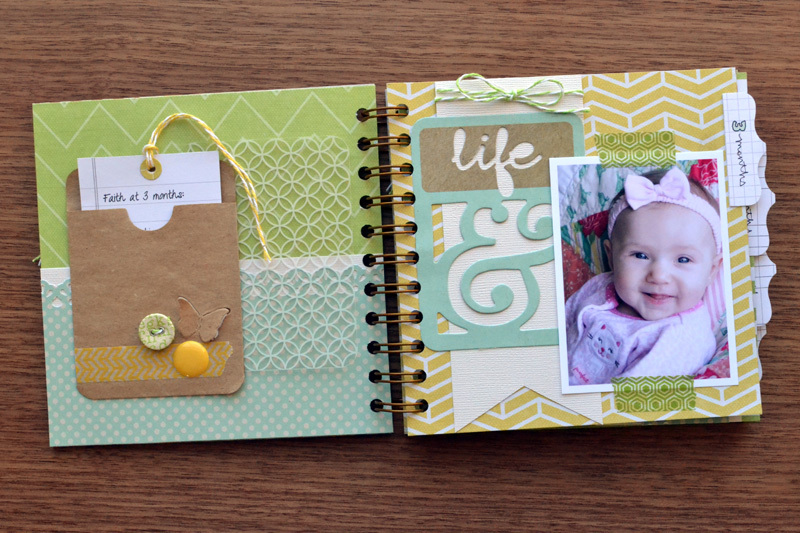 I like to repeat certain elements on each page in my mini albums to create a sense of unity throughout the album. Each page has a decorative edge I made with my 2 Edge Punch, a die cut Journaling Card, Washi Tape, and the same papers and colors. To indicate my daughter’s age on each page I created tabs by stamping the month, outlining it, and punching it out with my Tab Punch. I included lots of die cut shapes, envelopes, and tags, as well as enamel shapes, buttons, wood veneers and chipboard accents. 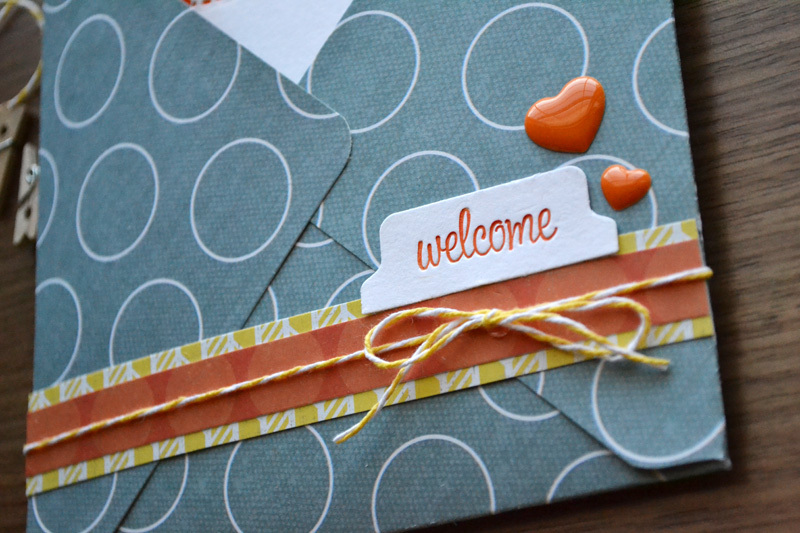 I even used my Envelope Punch Board to make a pocket for my journaling by cutting off the top flap of the envelope. This type of album is a really fun way to compare differences and track the growth and changes during baby’s first year. I hope this album inspires you–give these tips a try on your next project. Hello, and welcome to Baby Week here at the We R blog! This week we’ll be sharing lots of inspiration for all things baby–albums, announcements, decor, and more–so be sure to check back with us each day this week for more inspiration. To start the week off, here’s a sweet Instagram Baby Album I created using the new Instagram 4×4 Albums, and the Sheer Metallic Instagram Journaling Cards. 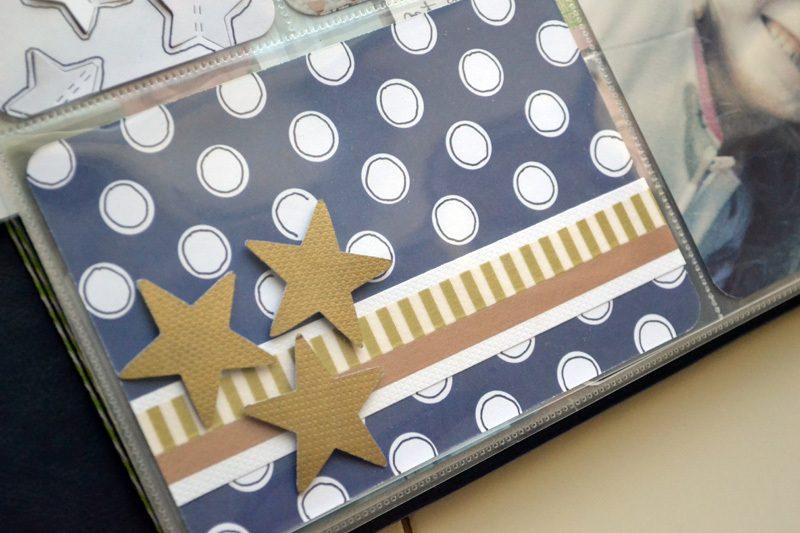 Be sure to check out the video below for some fun ideas, tips and tricks, plus the rest of the album pages! 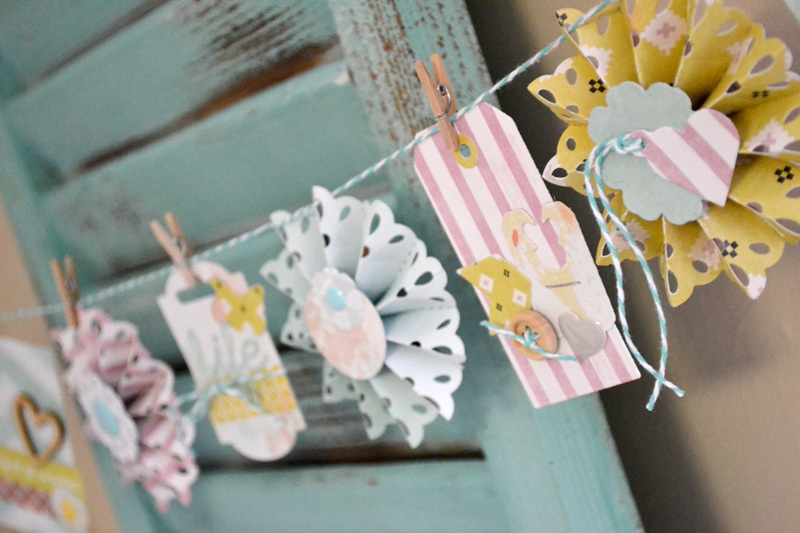 Looking for some spring door decor ideas? 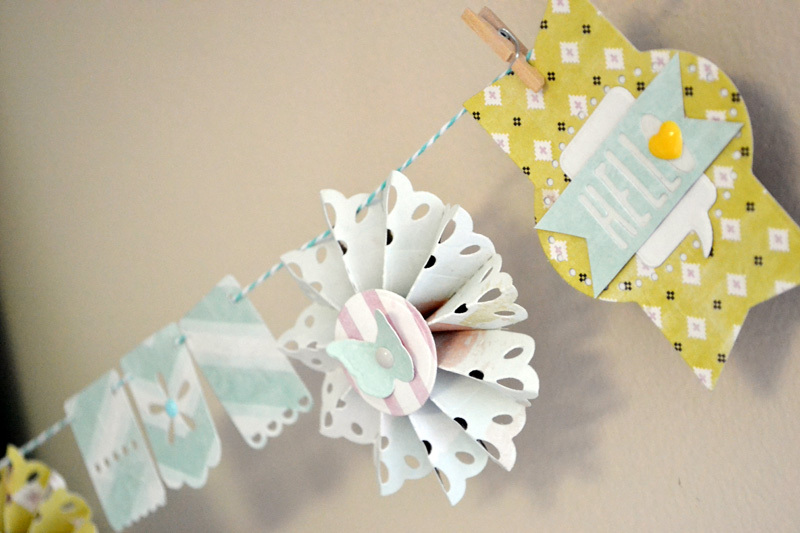 Nothing says “spring” like pinwheels, butterflies, and pennants! 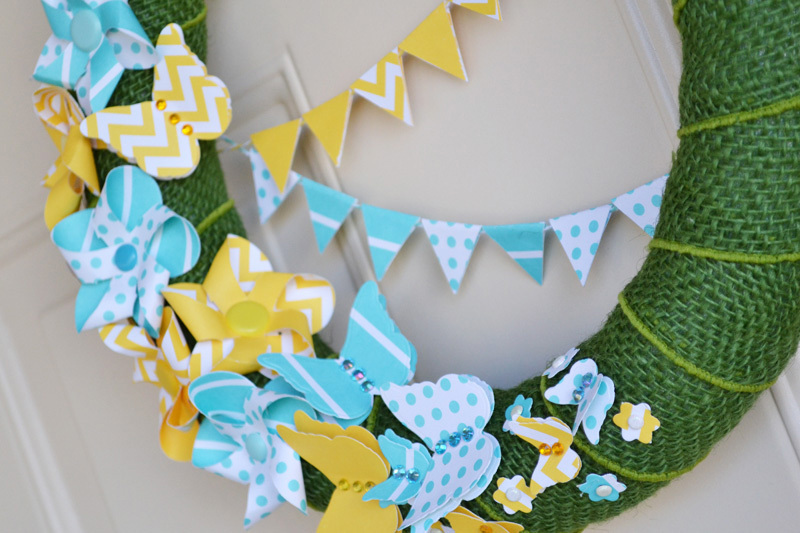 Hang this fresh spring wreath on your front door and say “welcome” to the new season. To create this wreath I started with a 12 inch foam wreath form and wrapped it with green burlap ribbon that I picked up at my local craft store, hot gluing it to the back of the wreath form and I wrapped it. Then I die cut several Pinwheel Flowers and Nesting Butterflies from yellow and aqua Basics paper with my Evolution and hot glued them in place on the wreath. I cut some pennants and hung them on some Baker’s Twine across the center of the wreath to add a little interest and balance, hot gluing the ends of the twine to the back of the wreath. 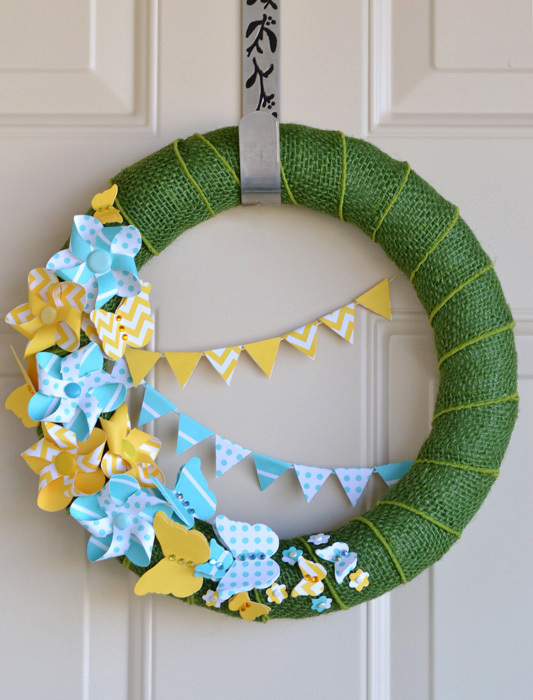 I hope this spring wreath inspires you! Happy spring crafting! Today I thought it would be fun to take on a challenge: include something old and something new on the same project. Here is my take on the challenge. Can you tell which is the old and which is the new? 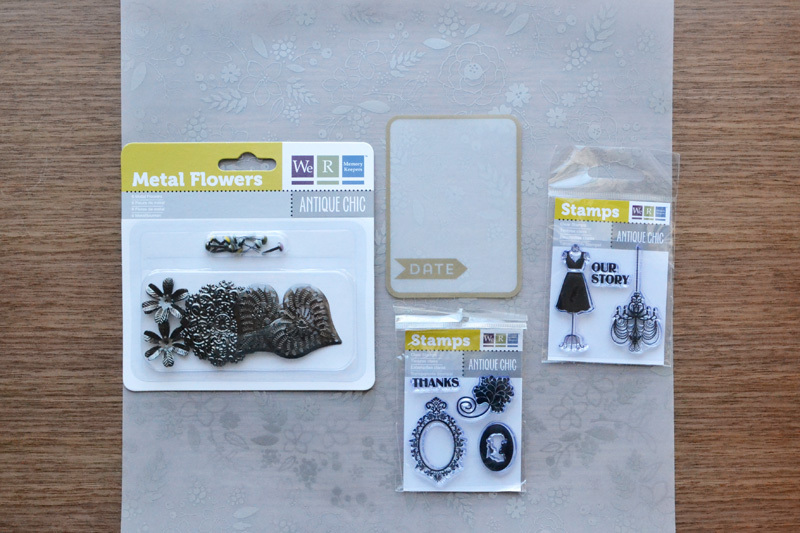 Here are the supplies I chose for my card: some new vellum products from the Sheer Metallic collection, and some old clear stamps and metal flowers from the Antique Chic collection. 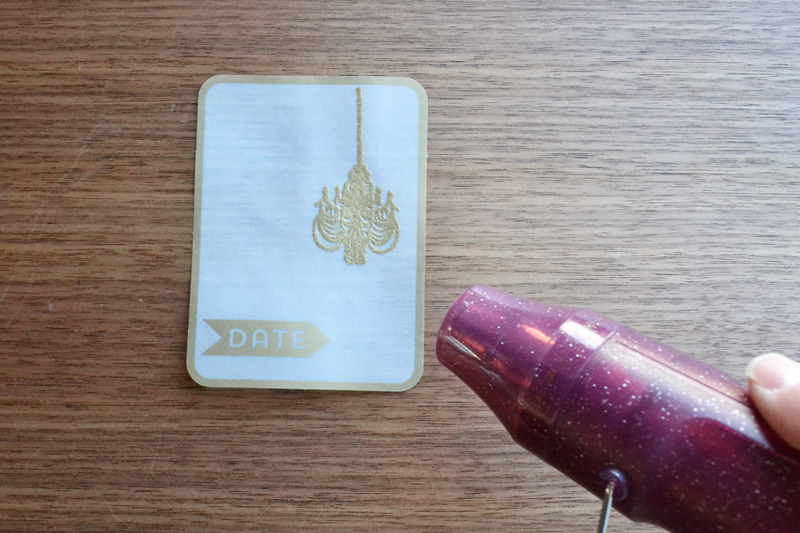 I stamped the chandelier image on the vellum journaling card with watermark ink, sprinkled gold metallic embossing powder over it, and then heat embossed it. Even though the stamp is older, combining it with the hot new metallic trend gives it a refreshed look! I added some Metallic Washi Tape, and other bits and pieces to complete my card. I love this challenge because it gets me digging into my stash of older products, and lets me use some of my favorite newer items too. Give it a try on your next project! After such a cold winter for so many of us spring is going to be a welcome change! 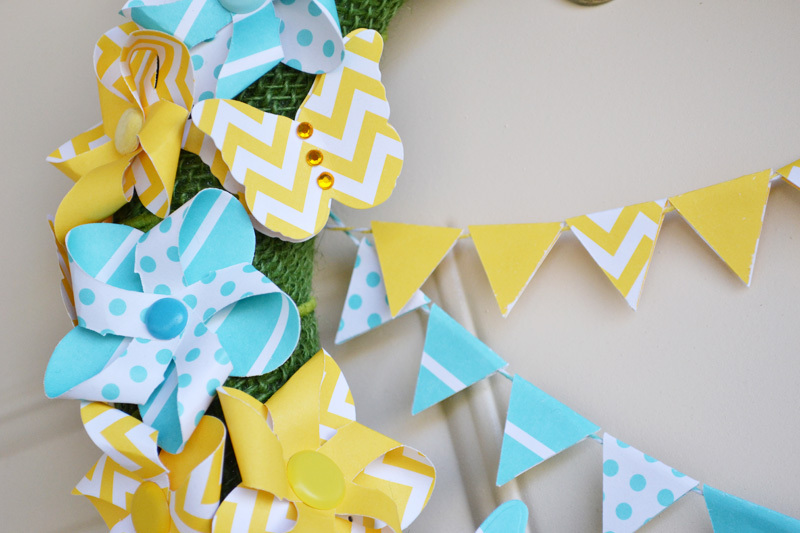 Here’s a spring decor idea to celebrate the warmer weather. 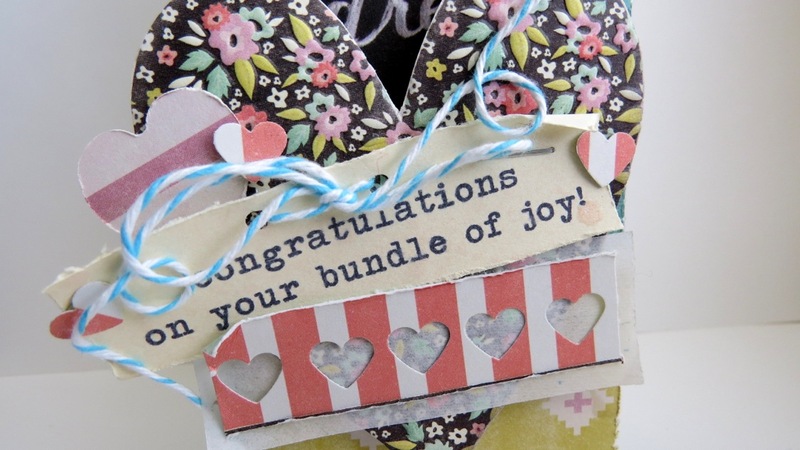 I combined several Lifestyle Crafts Dies with my Evolution to create this eclectic rosette banner. I alternated rosettes with various tags and labels that I die cut from the Tag It and Label It Kits. I also die cut some blossoms and butterflies from the Nesting Dies to add to the spring feel of the project. I added some text I created with the Pocket Scrap Dies, and finished off the banner with some Washi Tape, Baker’s Twine, and Enamel Dots and Shapes. I strung some of the pieces on the twine, and pinned others up with bare wood mini clothespins. 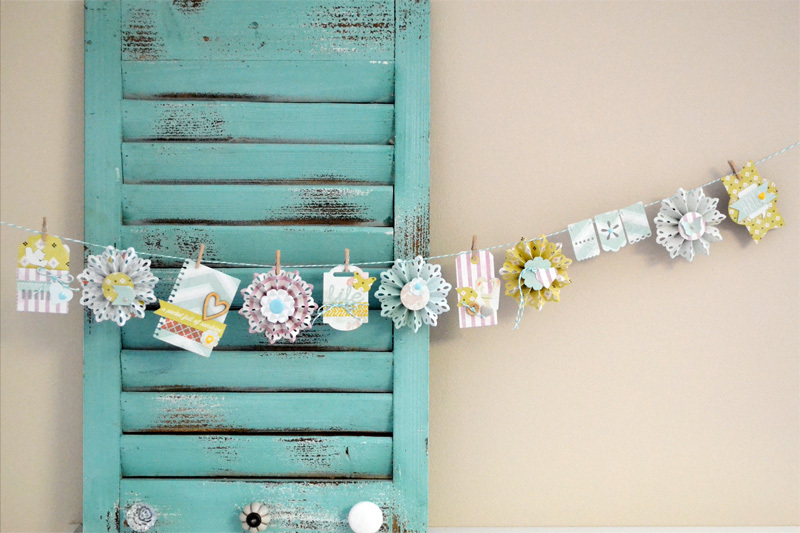 I love the pop of spring color and happy feel this banner adds to my craft room!